This book contains proven steps and strategies on how to succeed on negotiating with the use of effective techniques and tactics. 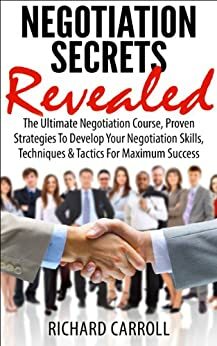 If you have been struggling with achieving success with negotiation, if you have observed that you are lacking better negotiation skills, therefore this book is for you. It will teach you how to reach the success you have been yearning for. It contains the best techniques on how to reach better deals with the help of proven negotiation techniques and tactics. So stop mulling over how you can be a skilled negotiator, because the answer is finally here. We are all familiar with the word “negotiation”, chiefly because everyone negotiates everyday to settle an argument and come up with a final decision. You may negotiate to your wife about who would wash the dishes; you may negotiate to your co-workers about whose task should this and that be; and you may negotiate to your boss about raising your salary. Whether you are aware of it or not, you a great part of your day negotiating. Unfortunately, facing negotiation everyday does not necessarily prepare you to the kind of negotiation businesspersons have to face. The everyday negotiation may not hone important skills needed for a better deal making in the business world. Unlike the usual negotiations that you face every day, negotiations between businesspersons are a lot more than just arguing and engaging in a conversation. It involves coming up in a final decision that both side dearly agree with and support. It involves showing your objective, and seeing theirs. It is aiming for what you need and want, while making sure they can achieve what they need and want too. In the business world, negotiation is a vital aspect of running and growing your business regardless of how small or big it is. However, fewer people have adequate knowledge on how to negotiate well; most people do not regard negotiation as one of their priorities and are not aware of the value they may get if they treasure effective negotiation skills. People with poor negotiation skills often think that to negotiate is to come up with a compromise that will only benefit them and will leave other side's objective thrown away. That is the reason why, more often than not, they do not succeed. Similarly, people who negotiate by instinct usually do not know how and why their negotiations come to nothing and when it does work, they do not have any ideas why. That is because negotiating by instinct alone usually does not involve assessment of the process and probable outcome first, predisposing them to lose in a negotiation. It is very important to have effective negotiation skills ranging from fundamental to critical ones. A good negotiation does not only involve reaching an offer beneficial to you, it should also involve building, maintaining, and improving relationships between the buyer and seller. In fact, good relationship good negotiation brings is what, most of the time, makes a business, company, and business partnership stand firmer. 1.0 out of 5 starsNothing new here. This book, frankly, was a waste of time and money, fortunately not much money. It consisted of one bromide after another and anyone brought up with courtesy and manners would, and certainly should, already know everything "revealed" by it. The whole book can be summarized by treating others with respect as well as yourself. I'd say that anyone who is over 25 already knows what's in this book. "Negotiation Secrets Revealed" by Richard Carroll was a useful and informative book in that it addresses the importance of negotiation skills and outlines the overall process of negotiation from doing your research before, to actually closing the deal. One thing Carroll does well throughout the book is providing tips and examples on how to go into the negotiation with the right outlook and positive attitude. As a young business student, I find the information provided in "Negotiation Secrets Revealed" to be a valuable reference point for me going forward in the business world. Although this is a short read, I would suggest it to anyone who is either looking to improve their negotiation skills, or simply just looking to obtain more information about the different stages of the negotiation process.